You might remember that Charles Vacanti and researchers at the RIKEN Institute in Japan reported a protocol for reprogramming mature mouse cells into pluripotent stem cells that could not only integrate into mouse embryos, but could also contribute to the formation of the placenta. To convert mature cells into pluripotent cells, Vacanti and others exposed the cells to slightly acidic conditions or other types of stressful conditions and the cells reverted to a pluripotent state. Even though Vacanti and others published these results in the prestigious journal Nature, as other scientists tried to replicate the results in these papers, they found themselves growing more and more frustrated. Also, some gaffes with a few of the figures contributed to a kind of pall that has hung over this research in general. The original makers of these cells, stress-acquired acquisition of pluripotency or STAP cells, have now made a detailed protocol of how they made their STAP cells publicly available at the Nature Protocol Exchange. Already. it is clear that a few things about the original paper are generating many questions. First of all, Charles Vacanti’s name does not appear on the protocol. He was the corresponding author of the original paper. Therefore the absence of his name raises some eyebrows. Secondly, the authors seem to have backed off a few of their original claims. For example one of the statements toward the beginning of the protocol says, “Despite its seeming simplicity, this procedure requires special care in cell handling and culture conditions, as well as in the choice of the starting cell population.” Whereas the original paper, on the first reading at least, seemed to convey that making STAP cells was fairly straightforward, this seems to no longer be the case, if the words of this protocol are taken at face value. Also, the protocol notes that cultured cells do not work with their protocol. The authors write, “Primary cells should be used. We have found that it is difficult to reprogram mouse embryonic fibroblasts (MEF) that have been expanded in vitro, while fresh MEF are competent.” This would probably explain inability of several well-regarded stem cell laboratories to recapitulate this work, since the majority of them probably used cultured cells. This, however, seems to contradict claims made in the original paper that multiple, distinct cell types could be converted into STAP cells. Another clarification that the protocol provides that was not made clear in the original paper is that STAP cells and STAP stem cells are not the same thing. According to the authors, the protocol provided at Nature Protocol Exchange produces STAP cells, which have the capacity to contribute to the embryo and the placenta. On the other hand, STAP stem cells, are made from STAP cells by growing them in ACTH-containing medium on feeder cells, after which the cells are switched to ESC media with 20% Fetal Bovine Serum. STAP stem cells have lost the ability to contribute to extra-embryonic tissues. Other comments from Knoepfler’s blog noted that the protocol does not work on mice older than one week old. Indeed, the protocol itself clearly states that “Cells from mice older than one week showed very poor reprogramming efficiency under the current protocol. Cells from male animals showed higher efficiency than those from female.” Thus the universe of cells that can be converted into STAP cells seems to have contracted by quite a bit. From all this it seems very likely that the STAP paper will need to go through several corrections. Some think that the paper should be retracted altogether. I think I agree with Knoepfler and we should take a “wait and see” approach. If some scientists can get this protocol to work, then great. But even then, multiple corrections to the original paper will need to be submitted. Also, the usefulness of these procedure for regenerative medicine seems suspect, at least at the moment. The cells types that can be reprogrammed with this protocol are simply too few for practical use. Also, to date, we only have Vacanti’s word that this protocol works on human cells. Forgive me, but given the gaffes associated with this present paper, that’s not terribly reassuring. Reports of Stimulus-Triggered Acquisition of Pluripotency or STAP cells has rocked the stem cell world. If adult cells can be converted into pluripotent stem cells so easily, then perhaps personalized, custom stem cells for each patient are just around the corner. However, the RIKEN institute, which was heavily involved in the research that brought STAP cells to the world has now opened an investigation into this research, since leading scientists have voiced discrepancies about some of the figures in the paper and others have failed to reproduce the results in the paper. Last week, Friday (February 14, 2014, spokespersons for the RIKEN centre, which is in Kobe, Japan, announced that the institute is looking into alleged irregularities in the work of biologist Haruko Obokata, who works at the institution. Obokata was the lead author listed on two papers that were published in the international journal Nature. These papers (Obokata, H. et al. Nature 505, 641–647 (2014), and Obokata, H. et al. Nature 505, 676–680 (2014) described a rather simple protocol for deriving pluripotent stem cells from adult mouse cells by exposing them to acidic conditions, other types of stresses such as physical pressure on cell membranes. The cells, according to these two publications, had virtually all the characteristics of mouse embryonic stem cells, but had the added ability to form placental structures, which is an ability that embryonic stem cells do not have. The investigation initiated by the RIKEN centre comes at the behest of scientists who have noticed that some of the images used in these papers might have been duplicated from other papers. Also, several scientists have notes that they have been unable, to date, to replicate her results. These concerns came to a head last week when the science blog PubPeer, and others, noted some problems in these two Nature papers and in an earlier paper from 2011. Obokata is also the first author of this 2011 paper (Obokata, H. et al. Tissue Eng. Part A 17, 607–15 (2011), and this paper contains a figure that seems to have been used for one of the figures in the 2014 paper. Also, there is another figure duplication. Harvard Medical School anesthesiologist Charles Vacanti who was the corresponding author of one of the Nature papers has said that has learned last week about a data mix up in the paper and has contacted the journal to request a correction. “It certainly appears to have been an honest mistake [that] did not affect any of the data, the conclusions or any other component of the paper,” says Vacanti. Note that Vacanti is a co-author on both papers and a corresponding author on one of them. In the other paper, Obokata serves as the corresponding author and this paper contains an image of two placentas that appear to be very similar. Teruhiko Wakayama works at Yamanashi University in Yamanashi prefecture, and he is a co-author on both of these papers. According to Wakayama, he sent more than a hundred images to Obokata and suggests that there was confusion over which to use. He says he is now looking into the problem. Additionally, ten prominent stem-cell scientists have been unable to repeat Obokata’s results. One particular blog listed eight failures from scientists in the field. However, most of those attempts did not use the same types of cells that Obokata used. Some scientists think that this could simply be a case of experienced scientists working with a system that they know very well and can manipulate easily, unlike outsiders to this same laboratory. For example, Qi Zhou, a cloning expert at the Institute of Zoology in Beijing, who says most of his mouse cells died after treatment with acid, says that “setting up the system is tricky; as an easy experiment in an experienced lab can be extremely difficult to others, I won’t comment on the authenticity of the work only based on the reproducibility of the technique in my lab,” says Zhou. However, others are more deeply concerned. For example, Jacob Hanna, a stem-cell biologist at the Weizmann Institute of Science in Rehovot, Israel, however, says “we should all be cautious not to persecute novel findings” but that he is “extremely concerned and sceptical”. He plans to try for about two months before giving up. It could be that the protocol is far more complicated that thought. For example, even Wakayama has been having trouble reproducing the results. To be sure, Wakayama and a student of his were able to replicate the experiment independently before publication, but only after being coached by Obokata. But since he moved to Yamanashi, he has had no luck. “It looks like an easy technique — just add acid — but it’s not that easy,” he says. Clearly one way to clear this up is for the authors of this groundbreaking paper to publish a detailed protocol on how to make STAP cells. This should clear up any problems with the papers. Vacanti says he has had no problem repeating the experiment and says he will let Obokata supply the protocol “to avoid any potential for variation that could lead to confusion”. The journal Nature has said that there are aware of the problems with the papers and looking into the matter. Reprogramming adult cells into pluripotent stem cells remains a major challenge to stem cell research. The process remains relatively inefficient and slow and a great deal of effort has been expended to improve the speed, efficiency and safety of the reprogramming procedure. Researchers from RIKEN in Japan have reported one piece of the reprogramming puzzle that can increase the efficiency of reprogramming. Shunsuke Ishii and his colleagues from RIKEN Tsukuba Institute in Ibaraki, Japan have identified two variant histone proteins that dramatically enhance the efficiency of induced pluripotent stem cell (iPS cell) derivation. These proteins might be the key to generating iPS cells. Terminally-differentiated adult cells can be reprogrammed into a stem-like pluripotent state either by artificially inducing the expression of four factors called the Yamanaka factors, or as recently shown by shocking them with sublethal stress, such as low pH or pressure. However, attempts to create totipotent stem cells capable of giving rise to a fully formed organism, from differentiated cells, have failed. However, a paper recently published in the journal Nature has shown that STAP or stimulus-triggered acquisition of pluripotency cells from mouse cells have the capacity to form placenta in culture and therefore, are totipotent. The study by Shunsuke Ishii and his RIKEN colleagues, which was published in the journal Cell Stem Cell, attempted to identify molecules in mammalian oocytes (eggs) that induce the complete reprograming of the genome and lead to the generation of totipotent embryonic stem cells. This is exactly what happens during normal fertilization, and during cloning by means of the technique known as Somatic-Cell Nuclear Transfer (SCNT). SCNT has been used successfully to clone various species of mammals, but the technique has serious limitations and its use on human cells has been controversial for ethical reasons. Ishii’s research group focused on two histone variants named TH2A and TH2B, which are known to be specific to the testes where they bind tightly to DNA and influence gene expression. Histones are proteins that bind to DNA non-specifically and act as little spool around which the DNA winds. These little wound spools of DNA then assemble into spirals that form thread-like structures. These threads are then looped around a protein scaffold to form the basic structure of a chromosome. This compacted form of DNA is called “chromatin,” and the DNA is compacted some 10,000 to 100,000 times. 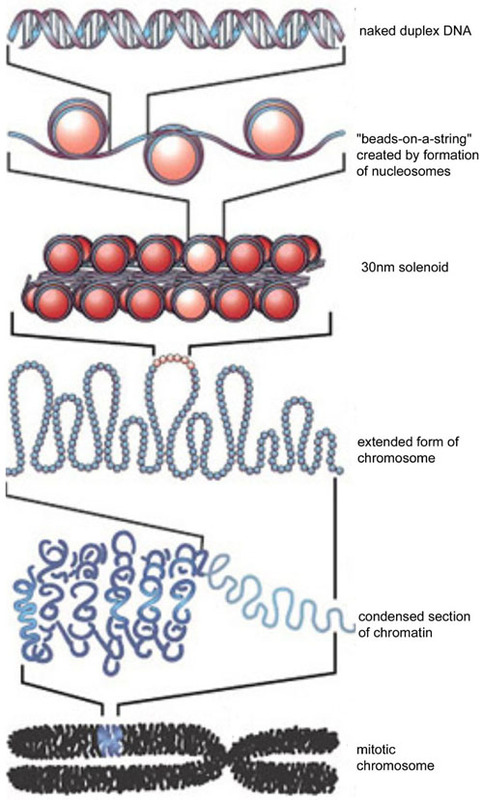 Histones are the main arbiters of chromatin formation. In the figure below, you can see that the “beads on a string” consist of histones with DNA wrapped around them. There are five “standard” histone proteins: H1, H2A, H2B, H3, and H4. H2A, H2B, H3 and H4 form the beads and the H1 histone brings the beads together to for the 30nm solenoid. Variant histones are different histones that assemble into beads that do not wrap the DNA quite as tightly or wrap it differently than the standard histones. Two variant histones in particular, TH2A and TH2B, tend to allow DNA wrapped into chromatin to form and more loosely packed structure that allows the expression of particular genes. When members of Ishii’s laboratory added these two variant histone proteins, TH2A/TH2B, to the Yamanaka cocktail (Oct4, c-Myc, Sox2, and Klf4) to reprogram mouse fibroblasts, they increased the efficiency of iPSC cell generation about twenty-fold and the speed of the process two- to threefold. In fact, TH2A and TH2B function as substitutes for two of the Yamanaka factors (Sox2 and c-Myc). Ishii and other made knockout mice that lacked the genes that encoded TH2A and TH2B. This work demonstrated that TH2A and TH2B function as a pair, and are highly expressed in oocytes and fertilized eggs. Furthermore, these two proteins are needed for the development of the embryo after fertilization, although their levels decrease as the embryo grows. In early embryos, TH2A and TH2B bind to DNA and induce an open chromatin structure in the paternal genome (the genome of sperm cells), which contributes to its activation after fertilization. When Shinya Yamanaka and his colleagues at the RIKEN Institute discovered a way to reprogram adult cells into embryonic stem cell-like cells, known as induced pluripotent stem cells (iPSCs), they overthrew a core understanding of cell and developmental biology; namely that once cells become committed to a particular cell fate, they irreversibly remain committed to that cell fate. Most of the work on iPSCs has examined how to increase the efficiency and safety of this reprogramming procedure. The slowness and inefficiency of this process has frustrated stem cell scientists for some time. Even though some progress has been made at increasing the efficiency of the reprogramming process, the “nuts and bolts” of why this procedure is so slow has remained unclear. However a recent paper from the laboratory of Shangqin Guo at the Yale School of Medicine has revealed a key component of why this procedure is so slow. That component is the speed of the cell cycle or the length of time the cell takes to divide. Fast-growing cells have lower barriers to keeping the cell committed to a particular cell fate. Thus faster-growing cells are more easily coaxed into being reprogrammed into pluripotency (the ability to differentiate into all adult cell types). Guo’s research team examined blood cell-forming stem cells in bone marrow. Normally these stem cells are multipotent, which means that they can differentiate into a limited number of adult cell types. The particular type of blood cells that the progeny of these stem cells differentiate into depends on the particular types of growth factors available to the cells. Guo and others found that these fast growing bone marrow stem cells could be reprogrammed in as little as four cell divisions. Ultrafast cell cycle is a key feature of these “privileged cells” that can be reprogrammed to efficiently. Slower-growing stem cells could not be reprogrammed nearly as fast. Thus the length of the cell cycle seemed to be the key to the speed with which cells could be reprogrammed to iPSCs. This study also has implications for several other applications, besides making individualized iPSCs for patients. Several human diseases are associated with abnormalities in the establishment of proper cell fates and abnormalities in the cell cycle. Therefore, Guo’s paper could provide insights into why certain genetic diseases affect cells the way they do. Researchers from the Centre for Genomic Regulation in Barcelona, Spain, have discovered an even faster and more efficient way to reprogram adult cells to make induced pluripotent stem cells (iPSCs). This new discovery decreases the time it takes to derived iPSCs from adult cells from a few weeks to a few days. It also elucidated new things about the reprogramming process for iPSCs and their potential for regenerative medical applications. iPSCs behave similarly to embryonic stem cells, but they can be created from terminally differentiated adult cells. The problem with the earlier protocols for the derivation of iPSCs is that only a very small percentage of cells were successfully reprogrammed (0.1%-2%). Also this reprogramming process takes weeks and is a rather hit-and-miss process. The Centre for Genomic Regulation (CRG) research team have been able to reprogram adult cells very efficiently and in a very short period of time. “Our group was using a particular transcription factor (C/EBPalpha) to reprogram one type of blood cells into another (transdifferentiation). We have now discovered that this factor also acts as a catalyst when reprogramming adult cells into iPS,” said Thomas Graf, senior group leader at the CRG and ICREA research professor. “The work that we’ve just published presents a detailed description of the mechanism for transforming a blood cell into an iPS. We now understand the mechanics used by the cell so we can reprogram it and make it become pluripotent again in a controlled way, successfully and in a short period of time,” said Graf. Genetic information is compacted into the nucleus like a wadded up ball of yarn. In order to access genes for gene expression, that ball of yarn has to be unwound so that the cell can find the information it needs. The C/EBPalpha (CCAAT/Enhancer Binding Protein alpha) protein temporarily unwinds that region of DNA that contains the genes necessary for the induction of pluripotency. Thus, when the reprogramming process begin, the right genes are activated and they enable the successful reprogramming all the cells. “We already knew that C/EBPalpha was related to cell transdifferentiation processes. We now know its role and why it serves as a catalyst in the reprogramming,” said Bruno Di Stefano, a PhD student. “Following the process described by Yamanaka the reprogramming took weeks, had a very small success rate and, in addition, accumulated mutations and errors. If we incorporate C/EBPalpha, the same process takes only a few days, has a much higher success rate and less possibility of errors, said Di Stefano. This discovery provides a remarkable insight into stem cell-forming molecular mechanisms, and is of great interest for those studies on the early stages of life, during embryonic development. At the same time, the work provides new clues for successfully reprogramming cells in humans and advances in regenerative medicine and its medical applications. Research groups at the University of Manchester, and University College, London, UK, have developed a new technique for reprogramming adult cells into induced pluripotent stem cells that greatly reduces the risk of tumor formation. Kostas Kostarelos, who is the principal investigator of the Nanomedicine Lab at the University of Manchester said that he and his colleagues have discovered a safe protocol for reprogramming adult cells into induced pluripotent stem cells (iPSCs). Because of their similarities to embryonic stem cells, many scientist hope that iPSCs are a viable to embryonic stem cells. This technique does not use viruses, which was the technique of choice in Yamanaka’s research to get genes into cells. Viruses like the kind used by Yamanaka, can cause mutations in the cells. Kostarelos’ technique uses no viruses, and therefore, the mutagenic properties of viruses are not an issue. However, Kostarelos and his team have determined that the technique they designed does not show this risk, unlike the virus-based methods. “[This is the ] only experimental technique to report the in vivo reprogramming of adult somatic cells to plurpotentcy using nonviral, transient, rapid and safe methods,” said Kostarelos. Since this approach uses circular plasmid DNA, the tumor risk is quite low, since plasmid DNA is rather short-lived under these conditions. Therefore, the risk of uncontrolled growth is rather low. While large volumes of plasmid DNA are required to reprogram these cells, the technique appears to be rather safe in laboratory animals. Also, after a burst of expression of the reprogramming factors, the expression of these genes decreased after several days. Furthermore, the cells that were reprogrammed differentiated into the surrounding tissues (in this case, liver cells). There were no signs in any of the laboratory animals of tumors or liver dysfunction. This is a remarkable proof-of-principle experiment that shows that reprogramming cells in a living body is fast and efficient and safe. A great deal more work is necessary in order to show that such a technique can use useful for regenerative medicine, but it is certainly a glorious start. Also involved in this paper were Açelya Yilmazer, Irene de Lázaro, and Cyrill Bussy. Several studies have shown that adult white fat cells can differentiate into other cell types by first dedifferentiating into a less committed cell type and then differentiating into heart, bone, cartilage, fat or other cell types. These dedifferentiated fat cells, which are also called DFAT cells, do not have any of the characteristics of the stem cell population normally found in fat (fat-based mesenchymal stromal cells). No one has studied DFAT cells in much detail. One study of rat DFAT cells showed that a very low percentage of cultured rat DFAT cells (0.4% – 1.2%) expressed embryonic stem cell-specific genes after 2 weeks. Beyond that, there is little known about DFAT cells. Could they be a potential source of pluripotent cells? A new study by Medet Jumabay and colleagues at the David Geffen School of Medicine at UCLA have isolated DFAT cells from adult white fat of mice and humans and characterized them. The results are fascinating and potentially useful for regenerative medicine. This paper utilizes a new way to isolate fat cells that guarantees their initial purity and a culture system that encourages isolated of DFAT cells. After the fat cells were isolated from liposuction the fat cells showed the characteristics of pluripotent stem cells for five to seven days in culture. In culture, DFAT cells spontaneously clumped into clusters that expressed several stem cell-specific genes. Once these stem cell-specific genes faded, genes associated with specific cell types, such as liver or nerves, or muscle, were expressed. Interestingly, when DFAT cells were implanted into mice with non-functional immune systems, they did not form tumors. Thus, fat-derived DFAT cells represent a highly plastic stem cell population for pluripotent cell research that is very responsive to changes in culture conditions and may benefit the development of cell-based therapies.